Guten tag aus Berlin! I’m here for a conference hosted by the German Institute for Economic Research, joining 14 other researchers who are presenting on various subjects related to well-being in Central Asia. 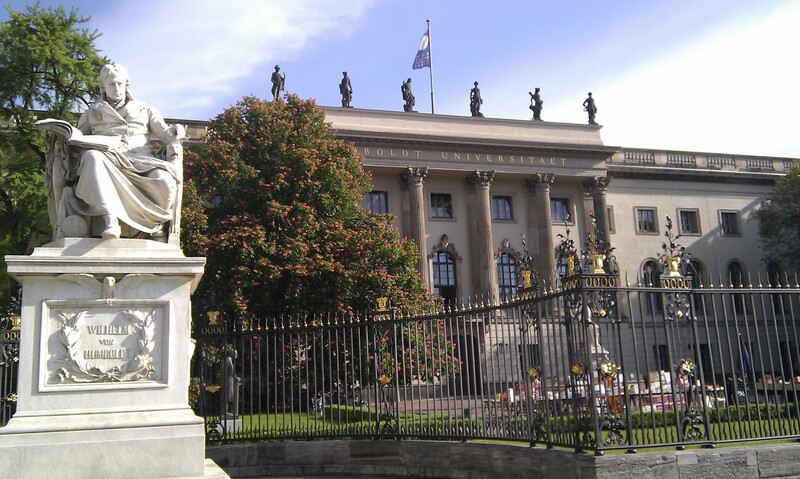 The first day of the conference was hosted yesterday at Humboldt University in central Berlin. As an aside, it’s hugely exciting for a higher education geek (me!) to be at the university named after the man who had such a strong influence on higher education. Teichler has divided the development of higher education into three phases: from the development of medieval universities (Bologna, Paris, Oxford etc), to a major period of change in the 19th century, through to the massification of the system post-World War 2. The Humboldtian model propounding unity of teaching and research was hugely influential in the second period of development. OK, that’s enough of a history lesson! Let’s move on to the conference itself. Things kicked off with a keynote speech by Nauro Campos of Brunel University/DFID. He pointed out that research on the “economics of happiness” is very much in vogue, although as a field it has been slowly developing since the 1970s. In transition countries, i.e. those which have undergone the change from being part of the Soviet Union to being post-Soviet independent countries, it’s bad news: there is “abnormally low life satisfaction in transition countries”. People are unhappy for age-related reasons (for example, because social safety nets such as health and pensions are dissolving), because there is rising income inequality and this generates unfairness, due to inequality of opportunity, and because of increased uncertainty. The presentations that followed afforced this theory through examinations of case study populations and/or data sets. For example, Barbara Dietz of the Institute for East European Studies in Regensburg (Germany) noted that internal migration in Kazakhstan has no significant impact on wage levels. Even if someone’s salary has gone up, their expenditure is likely to have increased on higher rents and living costs. Tobias Kraudzun of Free University Berlin (Germany) presented his group’s research into pastoralists in Murghab in the far east of Tajikistan. They found “dramatic de-development” of the region after the break up of theSoviet Union. For example, 68% of households in Murghab have monetary income of less than 400 somoni (about $20) per month, which means that the majority of people have difficulties earning a livelihood sufficient to meet their basic needs. Migration was a major theme underlying many of the presentations. Kraudzun noted the attitudes of young people in Murghab were more open to moving away from the region for educational purposes (though interestingly, ethnic Kyrygz families were less likely to support long-term migration than ethnic Pamiri families in the area). Kathryn Anderson of Vanderbilt University (USA) has found that migration from Kyrgyzstan (mainly toRussiato undertake low-skilled jobs) has no impact on enrolment in school education. As in, even if household members are working in Russia to earn more than they could at home, and they send some of those funds back home, the extra income does not make any difference to the number who go to school. One small glimmer of light was that Anderson’s research found that Tajik migrants sending remittances home do make a difference to children. Secondary school students from households with a migrant worker(s) stay at school longer and more of them go. In Tajikistan, though, one of the most important impacts on children’s education is the level of their parents’ education. Combining further research on this with the data on migrant workers could produce really interesting results. Are you suffering from capitalism? I very much enjoyed a presentation by Hilal Galip of the Bremen International Graduate School of Social Sciences (Germany), which started with the image used here on the left. Hilal presented the early results of a comparison between “happy” Kyrgyz and “unhappy” Hungarians, which tries to understand why the former show higher levels of life satisfaction despite the country’s poor economic/political situation. Day 2 of the conference had two panels, the first covering household economies and the second (including my paper) on knowledge and perceptions. In the first panel, I was very taken by Aksana Ismailbekova‘s (Crossroads Asia Competence Network, Germany) case study approach to examining how single mothers (generally widowers) are coping in the aftermath of the summer 2010 violence in Osh, southern Kyrgyzstan. Aksana’s approach was quite different from the quantitative-heavy presentations of day 1 (see image below). The economists in full swing – I’m sure the equations make sense to some people! Also in that panel was a presentation about women ‘doing it all’ in Tajikistan, by Mieke Meurs of the American University in Washington, D.C. (USA). Mieke’s analysis of household survey data gave some interesting propositions: for example, women in urban areas of Tajikistan spend more time on unpaid care work (childcare, looking after elderly relatives) than women in rural areas do even though they are more likely to have paid work. I’d like to see a further analysis distinguishing between women in urban and in rural areas as my perception is that patterns of women’s work (paid and unpaid) in urban areas, especially Dushanbe, are changing – fewer children per family, more paid work etc. and I’ll continue to publish parts of the paper on this blog. I got some interesting feedback and I’ll reflect on that and how I can take this research forward in the future. My concluding remarks – because you have to have these at a conference! – are that I have learnt a huge amount from the presentations and fellow presenters: about different research findings, about research methodologies and about the variety of research being undertaken about Central Asia. And being able to do so in Berlin, surrounded by its history, has been a huge privilege. This entry was posted in Kazakhstan, Kyrgyzstan, Tajikistan, Uncategorized and tagged Central Asia, Higher education, Kazakhstan, Kyrgyzstan, study abroad, Tajikistan. Hi Sitora, I now have access to the other papers. Could you send me your email address (by Facebook or to my gmail address) and I’ll forward you the presentation by Mieke. Thanks!